At the swipe of a finger or a click of mouse, information is everywhere. Sometimes though, our screens are crowded with icons, and switching between websites and apps, to find stories that matter, can be so time-consuming, frustrating, or both. Have you tried the Apple News app? It’s a go-to, virtual news stand that you can customise to find stories that fit your interests, and from sources you trust. 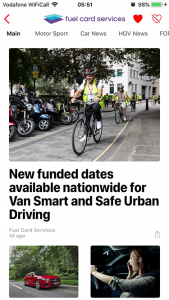 That’s why Fuel Card Services now posts its latest features onto the Apple News app. 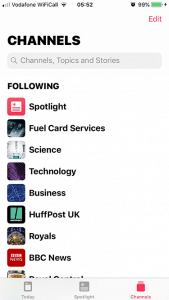 Simply visit the Apple News app, on your Apple iPhone or tablet device, type ‘Fuel Card Services’ in the Search option, and then click on ‘+’ to add us to your news feed. Now you’re all set, to view Fuel Card Services’ news as it arrives, anytime, anyplace and anywhere in the Apple News app. The post Fuel Card Services in the Apple News app appeared first on FCS Media.